Two bean shaped kidneys are attached to the posterior abdominal wall, one on each side of the vertebral column. The kidneys have a tough fibrous capsule (irregular dense connective tissue) for protection. Otherwise they have very little connective tissue between the nephrons. The kidney has a granular cortex (outer region). It has this appearance because it is full of ovoid filtration units. And a medullar (inner region) which has a more striated appearance. The kidney is organised into many lobes, organised in a pyramidal structure, where the outer portion is made up of cortex, and the inner portion is made up of the medulla. The kidney contains about 1 million functional units called nephrons, which are continuous with a system of collecting tubules. The nephrons are responsible for filtration, excretion and resorption, and they regulate ion balance, water content, help to stabilise blood pressure. This regulation of ion balance and water content (Osmoregulation) of the blood plasma means that all the other body fluids will also be regulated. Urine leaves the kidney via the ureter for temporary storage in the bladder. 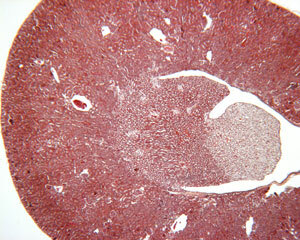 This is an H&E stained section of kidney -showing the cortex and the medulla. Make sure you can recognise the cortex and medullary regions of the kidney.